Last weekend, I tried something new. Or rather something I haven’t done since my days studying art at the Ontario College of Art about 30 years ago. 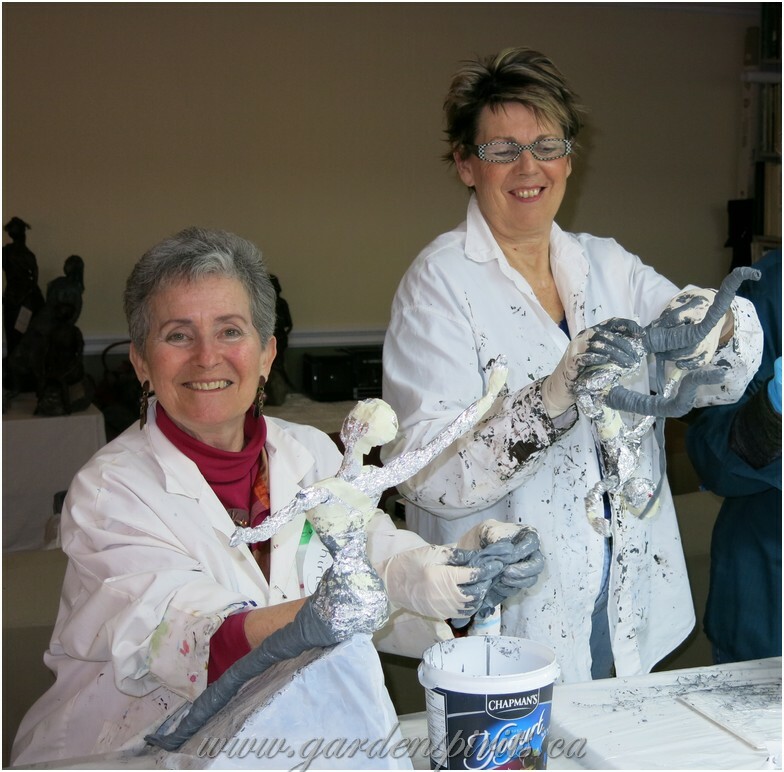 I attended Tineke Doornbosch’s Garden Spirits workshop to create an outdoor sculpture. This is the beginning. I am trying to model the form by folding and scrunching foil wrap over top of a wire which initially looked very much like a stick figure you would draw in kindergarten. 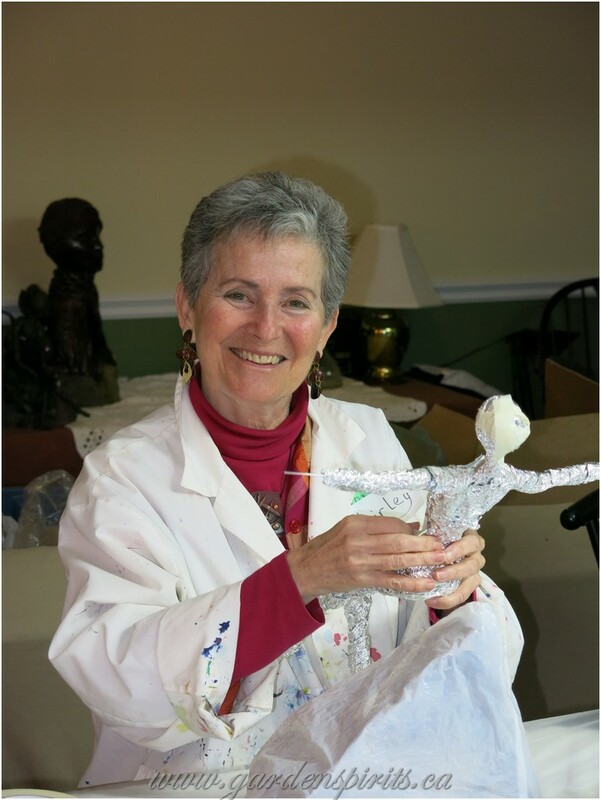 It is not easy trying to get the arms and legs to look shapely and real. Tineke and I getting down and dirty. We are dripping strips of cotton into a liquid acrylic mixture called Powertex. Next we further model the figure by wrapping the wet pieces around the foil armature we just made. Very messy! Did I ever tell you about the time I climbed a Mt Batur volcano in central Bali? To make the summit by sunrise, we started in the dark at 4 am. I resisted putting my hands down until I could no longer climb without putting my life in danger. That is when I first realized I don’t like dirty hands or dirt under my nails. I will do almost anything to avoid it. The figure at the end of this stage resembles a mummy. 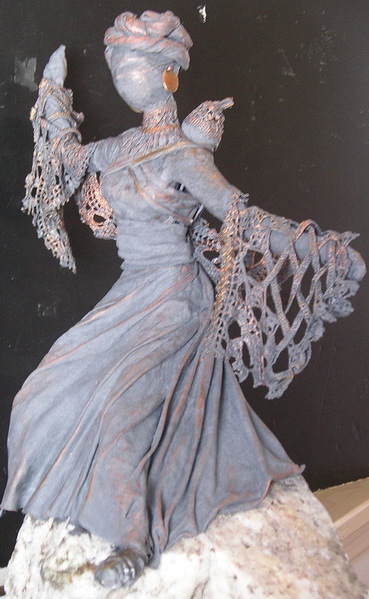 Now begins the elegant and fun part: the time to drape on the wet cloth to make the clothes and the lace shawl. It also covers up at lot of the mistakes underneath. Finally the pictures and the return home. I look and am very well pleased with the whole day and my output. But when I got my piece home, I began to notice the flaws. In my initial exuberance at the workshop, I had overlooked these. After recovering from a bout of flu (during which I obsessively dreamed about how to make the corrections), I set about trying to make it right. Can you guess the changes I am about to make? 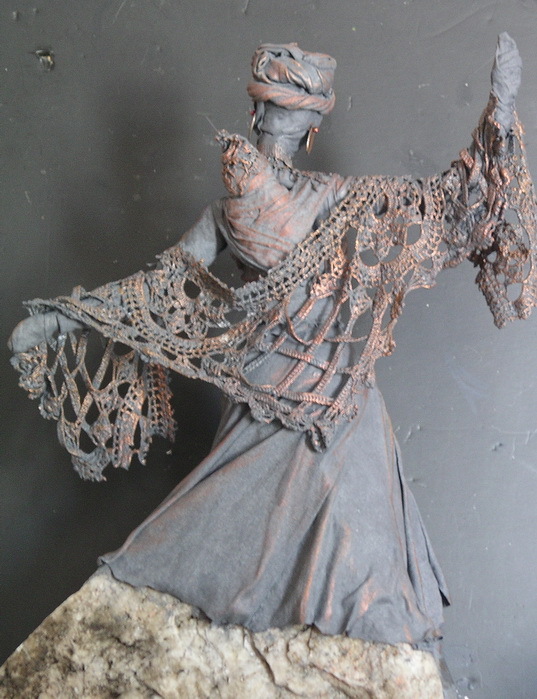 Here is Tribal Madonna, the final product. She is 19 in by 14 inches from hand to hand. She sits on the top of a large (very heavy) piece of marble. 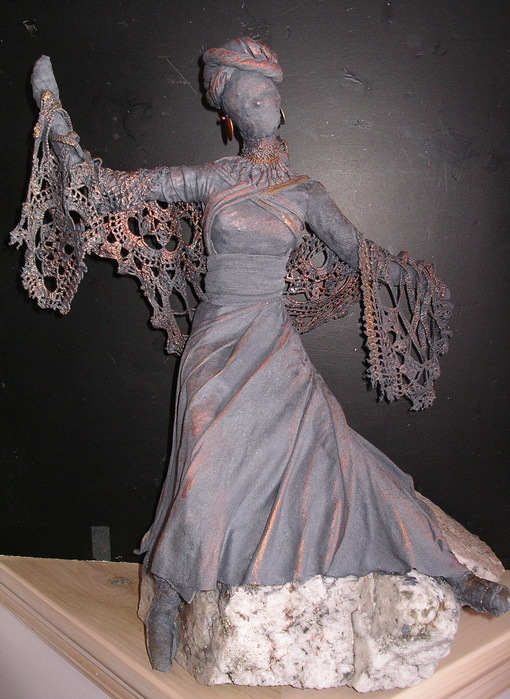 After removing the shawl very carefully, I thickened and reshaped her skinny left arm. I enlarged her feet making them more in proposition to the rest of her body. Also, I gave her a thicker less “Barbie-like” waistline. Mission accomplished! Now I am really pleased. 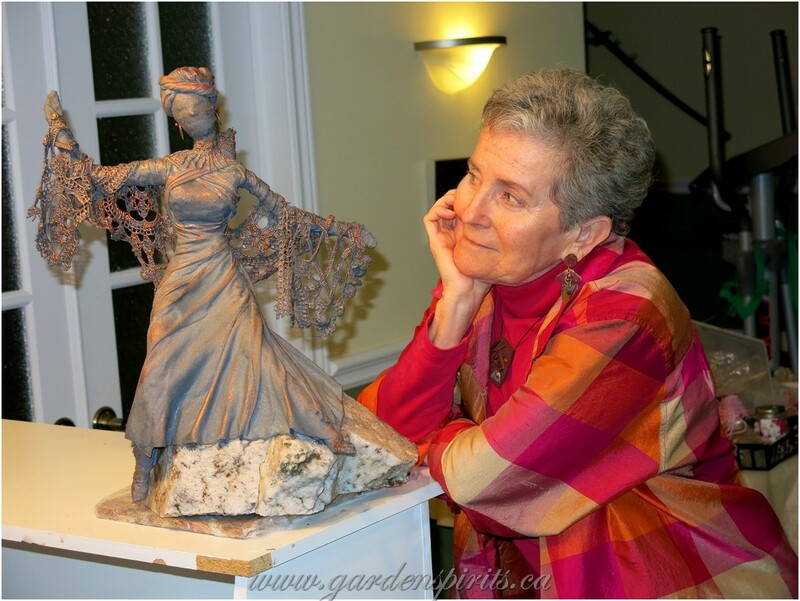 In the springtime, I will find her a display spot in the garden. What do you think…can you see any of my remaining flaws? Obviously being at home with all the swirling snow makes you very creative! Love this.Hope your drive was better than the weather reports on tv!